RTX London 2017 Music Video. Now on to talking about the event proper. 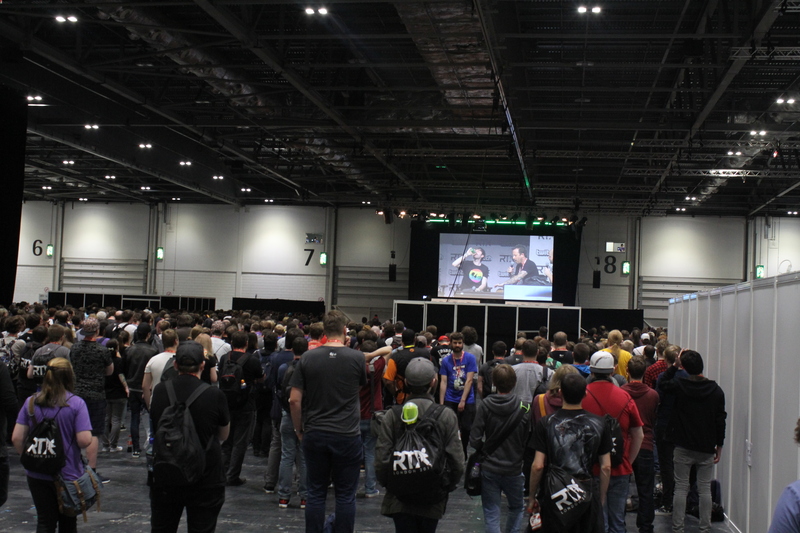 To get right to it, I was surprised the size RTX London ended up being. I think that comes from me going to ExCel a lot (going again the week this goes up in fact) and expecting the map I got for it to be more spread over the halls. I think I’m to used to MCM cramming something into every nook that a more regimented system like the one they used just felt different but that’ll be something I’ll be coming back to later. RTX was over four hall sections; one for the main area which included the stalls and live stage, another hall for the panel stage and two halls for ticketing. It might sound a bit much for the ticketing section but the best event I could compare it to in that regard is Summer in the City. It’s an event built around the stage events and ‘meet and greets’. Crowd control is paramount as swarms will descend for particular things like the “Off Topic” and “RT Podcast” specials. 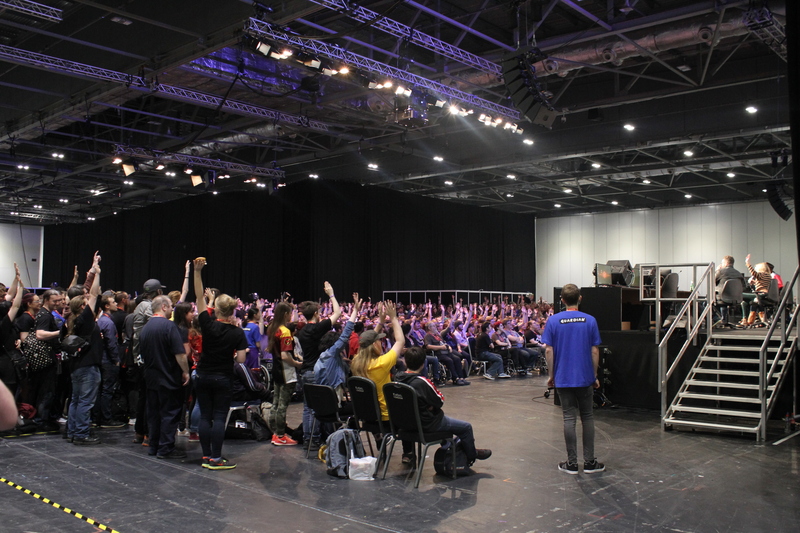 As it was the first RTX event in the UK it was a bit of a test case, more so to see if it was viable and sustainable especially compared to other RTX events that are more established. This is also another reason why is was a bit small in the exhibitor department. Groups that was there included the “Tentacle Collective” group, created by Payload Studios (makers of “Terra Tech”) and Nintendo showing off “Super Mario Odyssey”. They also had stage shows for games like “Sea of Thieves” and “Wolfenstein II” so they had a mix of indie and large studios. The structure of the layout worked well with little disruption. But there is that previously mentioned regimented system. It’s the only gripe I had and seemed like it was the only one other attendees had. Everything from the stage standing area to the stalls to the queuing areas was outlined with tape on the floor as was enforced by the ‘Guardians’ (the volunteers helping manage the on-floor goings on). And when I say enforced I mean with impunity. For the large crowds that came for the popular events, it went from crowd management to shepherding and penning. Part of me thinks that they didn’t anticipate what seemed to equate to the entire event turnout to come for one stage event at a time. Seeing most to all of the hall shuffle over to the stage to see “Off Topic” was the most obvious example for me. It ends up as an odd conclusion where the only way I think the event can improve on next time is by getting bigger. Give the main stage area its own hall and fill the gap where it originally was with more exhibitors. After that, the event was great. The staff was helpful, ticketing seemed to work smoothly for all involved, and the set up they had on the main stage was unobtrusive for the crowds watching so everyone could see no matter where you ended up. By the murmurings I heard it seems like plans are under way for a return in 2018. Fans of all things Rooster Teeth well find something welcome. RTX London is a welcome addition to the London convention cycle.